This is the time of year when sugar plums dance in our heads and these three sweet new polishes from Essie make me start humming the music from The Nutcracker march in the first act! You know how it goes: Daaa, da da da da, da, da, da, daaaa! 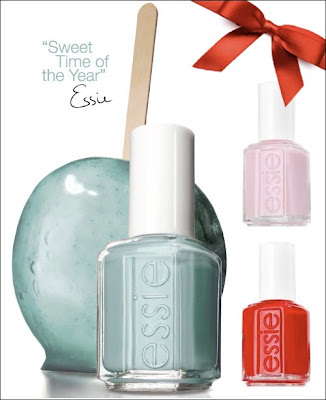 The mint candy apple is the most yummiest shade of green. It is a light color so it will look really nice on someone who has pale skin, which is most of us at this time of year. Rock candy is the softest shade of pink and looks beautiful with everything you wear this holiday season. And who doesn't love this lollipop red! The holidays wouldn't be complete if you didn't sport a shade of red! 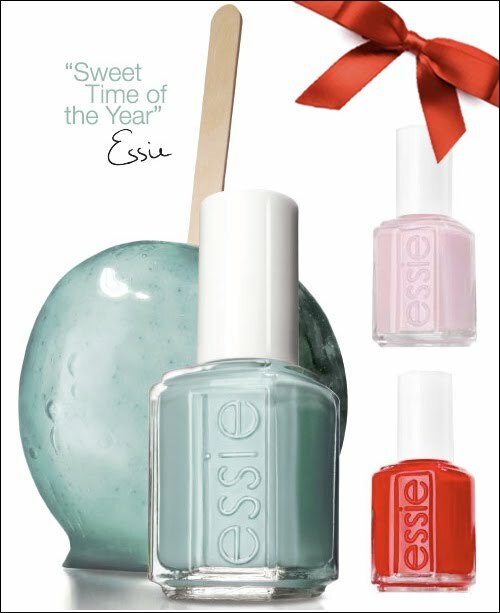 Go to essie.com to order or Trade Secret in the Bangor Mall also sells Essie polish. They also sell a gift package of all three colors in a mini size along with a 3 way glaze polish which is a base coat/top coat for $17! What a deal and what a great gift idea for your nail freak friends!